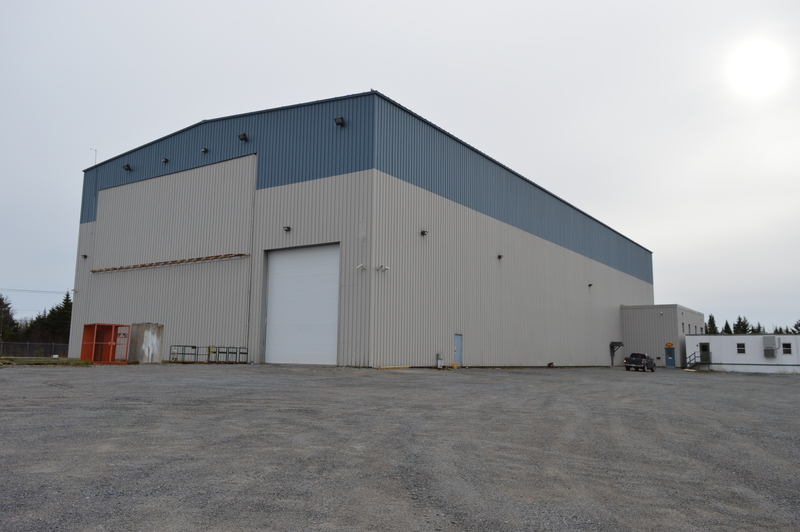 Superior Steel frame construction with a total of 24,373 sq ft on 27 acres. Built in 2004 and is in excellent condition. 20,400 sq ft shop area with ceiling clearance of 54′. 2,223 sq ft is two levels consisting of washrooms, electrical & stock room on main floor with finished mezzanine. Sprinklered. Efficiently heated by means of an oil fired boiler & in-floor radiant heat (glycol). 1200 amp elec. entrance W/3 phase power. Included are 2-10 ton & 2-5 ton ceiling cranes. Building features 40′ x60′ folding bay door plus 14′ grade level loading door. Newer 1,750 sq ft lunchroom built on side of bldg. Property is 27+/- acres. Features 7 acres of developed & fenced gravel yard. An exterior 75′ x 180′ 8-inch thick reinforced concrete slab is located adjacent to building. The slab was used for outdoor modulization. Located in Spruce Lake Industrial Park approximately 3 km from highway interchange. A $7.5 million dollar marine barge terminal was recently built nearby. Lease rate $7.50/sq ft. Tenant pays property taxes & all operating costs.